In his press statement at DC, Acting Spokesperson Mark C. Toner said the government of the United States does not know who was behind the attack at this time, but the administration is deeply concerned that Mr. Geagea may have been targeted because of his outspoken criticism of the Assad regime’s murderous repression and Hizballah’s destabilizing actions in Lebanon. 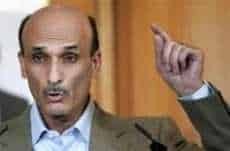 Reports say Samir Geagea was fired at in his Meerab residence, in north east Beirut. Samir Geagea after release in 2005. He says Lebanon and the international community have sought to bring about an end to impunity for political assassinations with the 2009 establishment of the Special Tribunal for Lebanon (STL) to investigate the assassinations of former Prime Minister Rafik Hariri and other public figures from 2004 to 2007. The United States reiterates its strong support for the work of the STL, he noted. The United States calls on the Government of Lebanon to cooperate fully with the Tribunal, including arresting those named in the 2011 indictment and providing funding to the Tribunal’s operations for 2012. On September 2005, in a strong show of support by his followers, christian Lebanese Forces leader, Samir Geagea, attacked the Hezbollah organisationin a speech he held at Harissa, a place of pilgrimage for Lebanese christians North of Beirut. Pointing at Hezbollah he told the crowd that allegiance to Syria does not serve the higher aim of national unity. His speech was interrupted several times by his followers shouting his nickname “Hakim,” which is Arabic and means doctor. Samir Geagea studied medicine before going to battle during the civil war from 1975 to 1990. Later on he finished his studies. He was imprisoned from 1994 to 2005 for warcrimes committed during the civil war despite amnesty was granted comprehensively to all militias.